Rising above the town, there is a chateau, rebuilt from a Gothic castle in the years 1675-1682. Inside the chateau grounds, on a square floor plan, are remains of the former castle fortification, a bastion called Manda. The Church of St Peter and Paul, made up of a triple nave with a protruding, pentagonal presbytery, covered with a gable roof, is also worth seeing. Next door stands the tower with a helmet-like roof and a lantern. However, the remains of the multi-side Hussite bastion made of stonework, which dates back to the period around the year 1470 and is also an interesting monument of the city, have nothing to do with the Hussites. A similar structure can also be found in the towns of Tábor and Žatec. The city with a rich history and the oldest Czech spa. The first reference of its medicinal springs comes from the 8th century. Teplice has passed through a plenty of stormy as well as gradual changes; it was at the height of fame on the turn of the 19th and the 20th century and it has been flourishing recently again. Very significant for the region was the colonisation process of religious orders during which they started to build a lot of monasteries in border regions already in the 12thcentury. In the case of Teplice they built the Benedictine monastery of Saint John the Baptist. Therefore, Teplice can boast a number of interesting sights - the chateau was built in the 16th century on the remains of an earlier Romanesque monastery; the Zámecké Square with the plague column by Matthias B. Braun dates back to the year 1718; the English-style chateau park also dates back to the 18th century. There are several significant churches in the city itself and the surroundings of Teplice offers visits to several other monasteries, churches, chateaux, etc. The first mention of Dubí as a mining place dates back to 1494 up to 1498, when tin miners stayed overnight there. The nascent settlement was called Dubí, or Eichwald in German, after the vast oak woods that spread on the surrounding hillsides. Here you can visit e.g. the Church of the Virgin Mary, located in the upper part of the village along the road to the town of Cínovec, which was built according to the Church of Santa Maria Dell'Orto in Venice in 1898. The Chapel of St Wolfgang, where an exhibition on the development of the settlement of the border areas and the development of crafts is installed, draws you attention as soon as you enter the car park. Walk past the chapel and the cemetery to perhaps the only a bit more demanding 0.5 km long ascend to the peak of the Komáří vížka. The dominant of the peak (807.5 m) is the oldest observation tower of the OreMountains, converted into the Hotel Komáří vížka. Even when the observation tower is not open to public, we are offered magnificent views in all directions (of the whole NatureParkEasternOreMountains, of the neighbouring Germany, České Středohoří /Bohemian Middle Uplands/, across the JizeraMountains up to the KrkonošeMountains) from the panoramic terrace or from the restaurant, if the visibility is good. 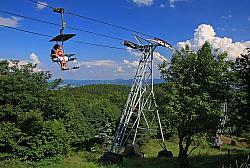 You can also be taken to the Komáří Hillock by a chairlift from Krupka, or more precisely from its part called Bohosudov. At the time of its creation in 1950-1952, the chairlift was the longest one in Central Europe, with the length being 2,348 meters and the elevation of 482 meters.